The four chapbooks collected in A Peculiar Feeling of Restlessness, three of them finalists and one of them the winner of the Rose Metal Press first annual short short chapbook contest, all revel in the succinctness of their form, the underlying tension anchored beneath each story of 1,000 words or less. These stories are peculiar; they resonate with restlessness. They are deft, they are gritty, and they are lyrical. 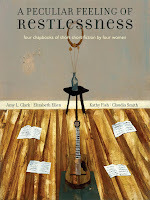 Laughter, Applause, Laughter, Music, Applause by Kathy Fish, Wanting by Amy L. Clark, Sixteen Miles Outside of Phoenix by Elizabeth Ellen, and The Sky Is a Well by Claudia Smith (the reprint of her sold out chapboook) combine four multi-layered portrayals of beautiful uneasiness into a collection rich with wit, grace, and originality. Order yours today! And visit our website for more information about the press. This collection of short shorts by Emerson Alumni was published in December 2006. The anthology features: Derrick Ableman, Joann Avallon, Rusty Barnes, Jane Berentson, Stace Budzko, Leslie Busler, Jennifer Carr, Keith Carter, Chip Cheek, Amy L. Clark, Kirsten Culbertson, Mark DeCarteret, Erin Dionne, Denise Duhamel, Elizabeth Kemper French, Lee Harrington, Jen Heller, Chris Helmuth, Steve Himmer, Brian Hinshaw, Jacqueline Holland, Amanda Holzer, Shannon Huffman, John F. Kersey, Laurel Dile King, Mariette Landry, Molly Lanzarotta, Don Lee, Matt Marinovich, Tara L. Masih, Melissa McCracken, Sheehan McGuirk, LaTanya McQueen, Maryanne O’Hara, Janice O’Leary, Josh Pahigian, Jennifer Pieroni, Robert Repino, Ashley Rice, Matt Rittenhouse, Joe Robb, Beth Anne Royer, Brian Ruuska, Mary Saliba, Nina R. Scheider, Kimberly Ann Southwick, R. S. Steinberg, Cam Terwilliger, Terry Thuemling, and Laura van den Berg, as well as an introduction by Ron Carlson and an afterword by Pamela Painter.